To celebrate five years of bringing great live music to the Ross Farm, the Friends of the Boudinot-Southard-Ross Estate looked back to some of our favorites through those years as we curated this milestone season! While we couldn’t have all of our favorites, we’re mighty pleased with the concerts we will be bringing to you this spring and summer. Tony Lucca kicks off our season on Sunday afternoon, April 28, while Matt Hires will play his first outdoor set (weather permitting!) at the Farm on Friday night, May 17. Liz Longley is a new artist for us, but she has a devoted following and we are so excited to bring her to the Farm on Saturday, June 8. While our Ross Farm crowd fell in love with Stephen Kellogg last year, he apparently fell in love with us, too, and we are thrilled he’s returning for an outdoor concert on Saturday, June 22! We will wrap up the first part of our season with returning favorites The End of America on Saturday, July 27. RSVP and donation information for our first three concerts is available on the website and also on our Facebook page @TheRossFarm and we’ll fill in the details for the next two concerts as we get closer to the summer. RSVPs are helpful for planning purposes and also in the event a concert has to be moved indoors due to weather, those who have RSVPd have seating priority. Donations, if desired, can be made via PayPal on the website, or at the door. Our awesome poster was designed by Kayleigh Torcivia, RHS Class of 2015 and Rutgers 2019. 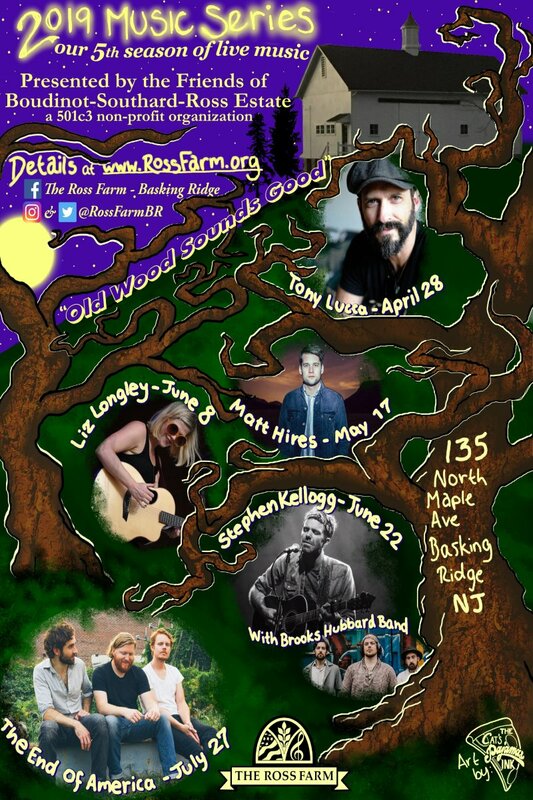 She is the daughter of our board member David and Maryann Torcivia, and she has also designed the Rock the Barn posters since the inception of our Ross Farm Music Series. We are grateful for her talent and generosity!